The excellent, the amusing, and the off-beat. In the early 1990’s, I moved to Moreland Hills, a suburb of Cleveland, Ohio. The comfortable house I rented on Hemlock Lane had been empty for a couple of years since the previous owner had died. A few days after I had settled in, a loud alarm sounded, and within minutes, emergency vehicles of every description were in my driveway, and a huge firetruck was on the street, all with lights flashing. The policemen who came to my door said that a fire alarm had gone off. Apparently, the former owner had a security system, and it had malfunctioned. I told them not to worry, but they said they had to check out the house anyway, just in case. Some of them went to the basement or around the main floor. A policeman started up the stairs to the attic, but when I told him I could turn on the light switch for him, he said no thanks because he had a flashlight. Within seconds I heard a loud scream coming from the attic! 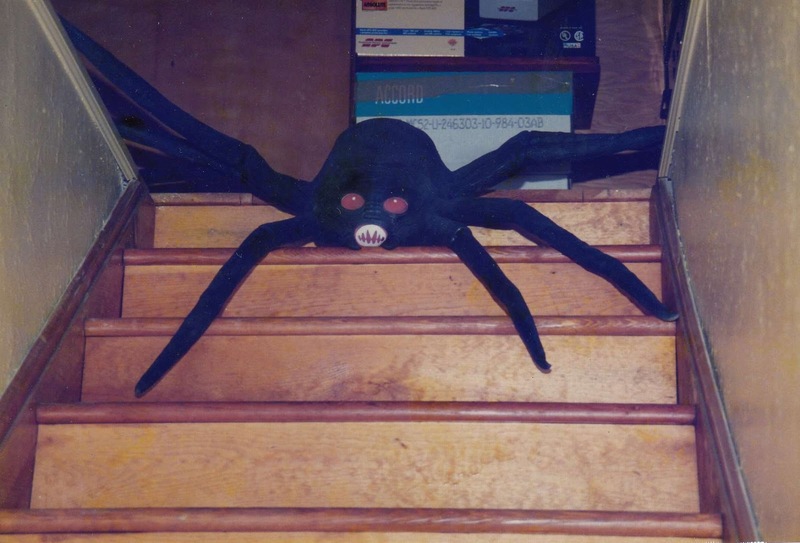 In this brightly lit photo, the spider seems rather friendly, but suddenly coming across him in that dim attic, lit only by a flashlight, must have been quite a shock. He probably had been focusing the beam downward on the steps for the ascent, then suddenly seen/felt the presence of this huge creature, which must have looked more realistic in the dim light. I should mention that the house was in a wooded area with many creatures that might possibly have entered an attic. That house seemed to be made for parties and entertainment. In addition to a large kitchen, there was a huge combined living room-dining room. I started an annual tradition of large Halloween parties, splitting it into two parties, one more for friends and one more for family. One year when I tried to count, there were at least 125 people at the big party, and 50 people at the “little” one. There was so much to put up that I always had a pre-Halloween decorating party for the core group—at the end there were about 50 boxes of decorations, not including large plastic skeletons, etc. Some people draped large swags of lights and ribbons around the room, while others concentrated on special vignettes to be placed on tables or in odd corners. The parties were tremendous fun. We all crowded in, and there was overflow room in the basement (also decorated) and on the back porch (also decorated). We had great food and live entertainment, all provided by the guests. An odd thing: almost no alcohol was consumed—perhaps three cans by the whole crowd. Some people had brought beer or wine as a contribution, but almost all of it I had to dispose of later. Unfortunately, I do not like to post photos of people on the blog, but I did take some photos of the empty rooms before the party started. 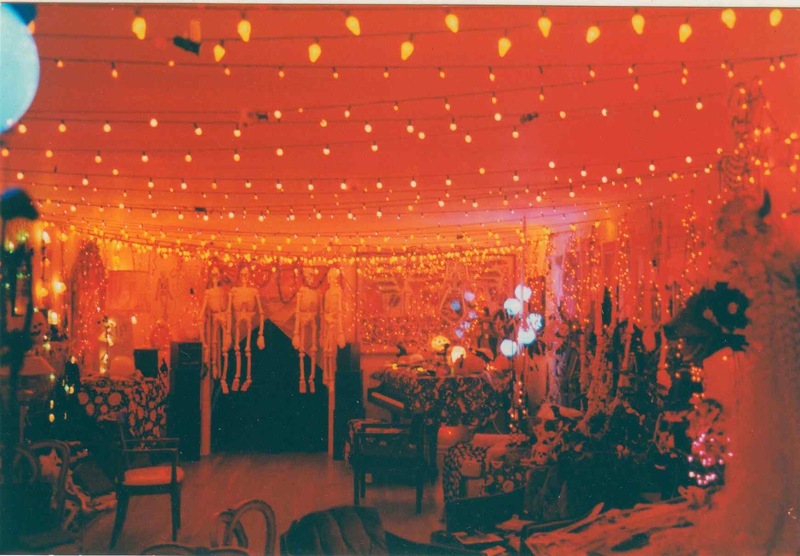 Regular light bulbs were removed (or at least turned off), all the illumination coming from multiple strings of orange lights. 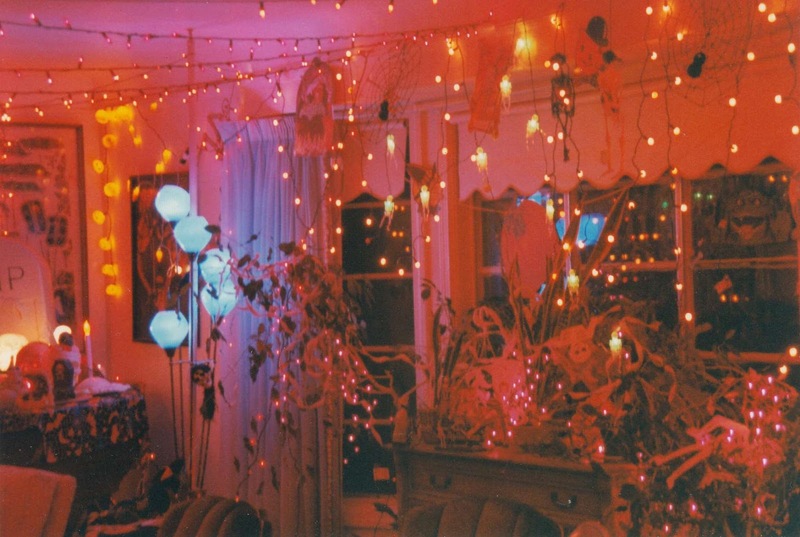 In fact, there were so many light strings connected to each other that I was surprised that a fuse never blow or the house never burned down. Although the policeman quickly recovered from his scare on that early visit, and the ghosts in the above photos are made of paper or plastic, my house on Hemlock Lane was in fact haunted. When I moved in, the house was empty except for an old locked hope chest placed against the chimney in the large attic. The current owner explained that there was no key for it, so they had never seen inside it. As we got used to living in the house, a curious phenomenon emerged. At night, slow, plodding footsteps were often heard coming from the attic. These were not the scurrying sounds of a raccoon or squirrel that might have gotten in, or the ordinary creaking of a house, but very human in quality, heavy and steady. We started joking that perhaps the old owner had done away with his wife, and it was her body in the locked hope chest (shaped like a small coffin) who was making these nightly excursions. We even greeted her (“How are you, Mrs. C.?”) when we passed the chest, hoping to propitiate its occupant. These sounds lasted the whole decade I lived in the house, and everyone who stayed overnight heard them. My friend Hiro was especially horrified/fascinated, and wanted to break open the chest, but I told him I could not do that. One day near the end of my tenure there, however, the current owner gave me permission to open the chest if I could. Breaking the lock or chest, while it might have been dramatic, was not necessary. I have a variety of antique keys accumulated over the years, including a large ring of old cabinet keys. The next time Hiro came over, we tried the keys one at a time. Eventually one key fit perfectly, and the lock clicked open. Instead of jewels, skeletons, and gleaming coins, we were greeted by the sight of green cloth. The trunk was filled with old greenish-gray curtains. And not nice curtains, either. They looked like they had come out of a motel from the 1940’s. We unpacked these, but there was little else in the chest; at the bottom were some old-fashioned bathing suits of the kind worn in the 1920’s. I’m not really sure whether or not the ghost was vanquished by this act. The next couple of months before I moved out were unusually hectic, and I can’t recall whether or not I heard the footsteps again. 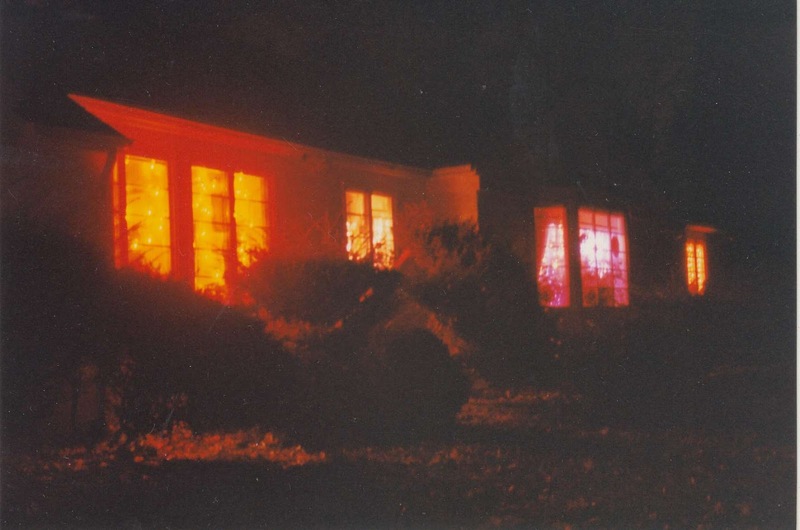 Did you ever live in a house that seemed (or was) haunted? Did you find the explanation, or did it remain a mystery? I end this post with one final view of my old house from the outside front—the neighbors must all have thought it was on fire! All photos taken by and property of the author. 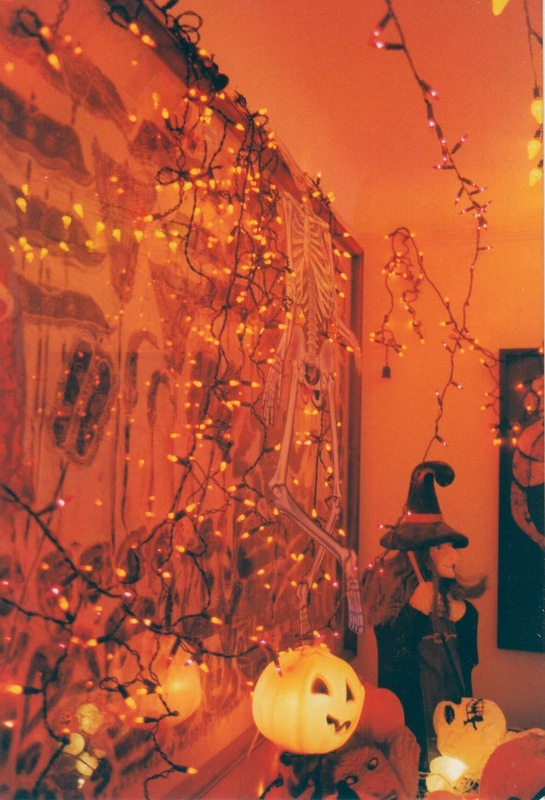 Halloween, a contraction of All Hallows Eve, as it is celebrated these days is largely of British and Irish origin. To many people in the UK it now looks like an American import that has been crassly over-commercialised. I have some sympathy for that view.....but it can be a lot of fun! Incidentally, I share your reluctance to post pictures of people who are not in the public domain Jim. Hello Bazza, No one really takes the origins of Halloween too seriously, but it does create a fun atmosphere in which you can feel a small chill of horror, as in an old-fashioned horror movie. 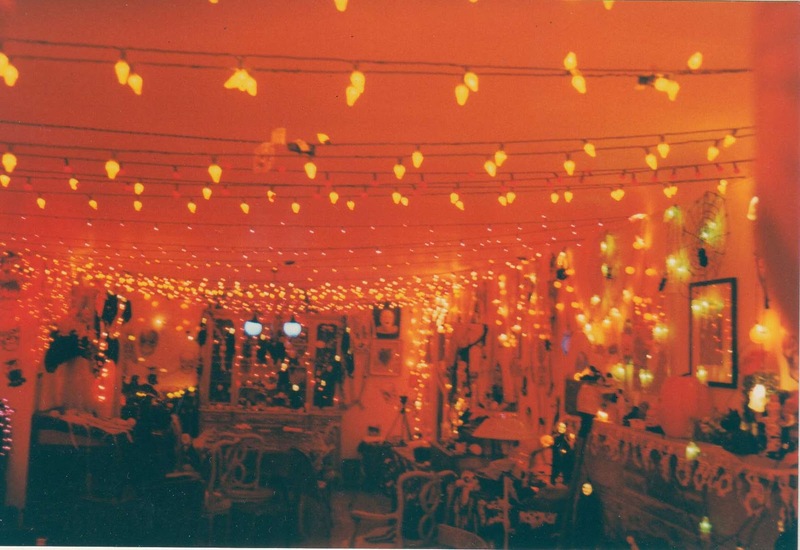 As you say, some don't even think that far, but just enjoy the party atmosphere, or the bizarre aesthetics of it all. I too am assuming that Halloween has witchy or ghostly origins, all meant to scare young children and wives into behaving well. So I would be worried about your street name, Hemlock Lane. Hello Hels, It seems that for a couple of centuries, at least, Halloween has had the opposite effect and encouraged mischief in children. However, I can imagine that the scare tactics once had a more profound effect. The book, The Seashell on the Mountaintop, about the early development of the geological sciences, tells of the 17th century Athanasius Kircher, who secretly projected devil images into windows of houses to encourage church attendance in the age that quashed Galileo. To be honest, your Halloween on Hemlock Lane has been the best story about this subject, that I've ever read. How did you feel for actually having a key in your collection that could open that trunk?! Strange contents I must say but it made for lots of suspicion and added thrill to the season. Strange for never having been involved in Halloween, before coming to the USA but like Bazza here above stated; it is way over commercialized and with that the special feeling has been kind of nipped in the bud. Not being scared of anything it would not have bothered me the least. Great photos to your story and thanks for sharing! Hello Mariette, Thank you for your kind words. Many boxes and small cabinets had simple locks, and one key can open many locks if you experiment a bit. A hope chest was not considered a high-security type of situation. Reggie Darling once commented that he was able to supply missing keys for his antiques from a dealer who kept a large assortment. Hello Jim - what tales of great entertainment, and a little bit of horror too, emanated from Hemlock Lane under your stewardship! I have never seen a house decorated with such a theatrical flair and panache. I suspect that your move away from Hemlock Lane must still be talked about and mourned even to this day. Hello Rosemary, If there was any flair present, it was the result of my friends working at the pre-decorating party. That house was great for entertaining even when not decorated. We had Thanksgiving there also, and often relaxing times with just a few people. 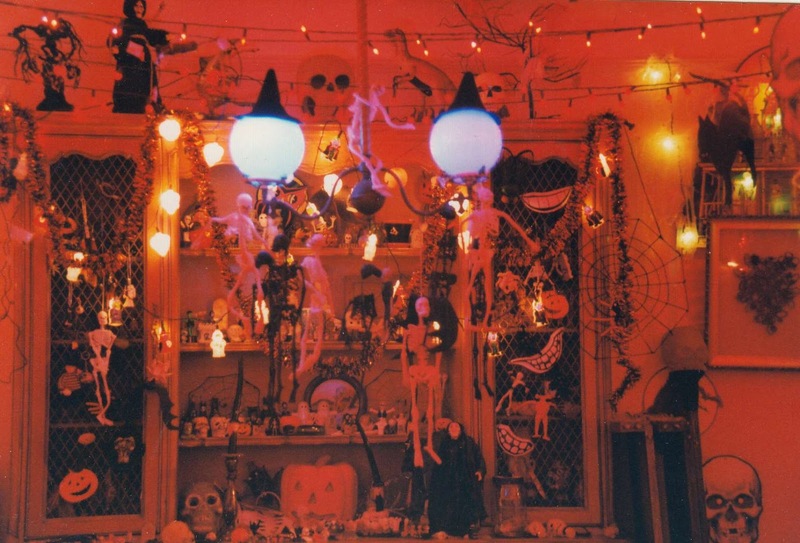 Well, I award you an 'A' for effort, getting into the spirit of Halloween with that enormous decorating project. Our house has only a few pumpkins at the front door this year, which is pretty much all we do around here on Halloween most years come to think of it. On the first night we moved into our house, my husband and I were horrified to hear thumping footsteps traveling along the back hallway's wooden floorboards. When we bucked up enough courage to investigate, we found our pet ferret in action. He had stolen a hiking boot and was dragging it along the hallway in hopes of claiming the innersole. We were relieved at our discovery and in fits of laughter knowing our minds had momentarily been tricked into believing the noises were possibly the previous owner (who had died) coming back to haunt her old house. Happy Halloween to you Jim! Hello CD, Happy Halloween to you, too! The Halloween project seemed to get bigger each year, but we looked forward to it, and it well repaid all efforts put into it. THANK YOU for BEEFING UP MY HALLOWEEN EVE................I doubt we will get one TRICK or TREATER!Which means I will have to eat the CANDY!!!! !OH< WELL...........if I must!Chocolate is not good for dogs SO............it shall be mine! Hello Contessa, I'm glad you liked the Halloween decorations. It all had to come down and be cleared away soon, because we also had Thanksgiving at my house, which was very traditional with no extravagant decorations--Halloween was our only time to pull out all the stops. That ginormous spider in the attic - poor policeman!!! What a story, Jim. And you sure know how to throw a party. Happy Halloween from Maryland! We are waiting for the neighborhood kiddies. Hell Loi, One of the best parts of the party was at the end, when a few faithful always stayed to form a self-appointed clean-up crew, so I never had a giant mess to face the next day, or worry about wet glasses on the furniture. Ni hao, Jim. Reading your great post, I recalled "Lexington ghosts", a short story by Haruki Murakami. The last photo is really amazing. Who is NOT surprised at it? Thanks for your comment on my post. I love Jomon earthenware, too. Hello rtc, I'll have to try to get Lexington Ghosts, although it does not appear to have an English edition. The effect from outside the house was even better in person--it really glowed! When you visit Tokyo, please go to Seikado Bunko to see a tea bowl "yohen tenmoku". This type bowl is remained 5pcs only. I've never lived in a haunted house but have had ghost 'experiences' in other hotels/inns that I've blogged about before. I'm not a huge halloween person but I do believe in ghosts! Of the five homes I have occupied, only one was old enough to possibly host a ghost. It was in suburban Boston and approximately 70 years old when I moved in. I and my new husband at the time, invited a Feng Shui expert to check it out. Our Feng Shui consultant did not find anything noteworthy but did suggest rearranging some furniture and moving around some objects. 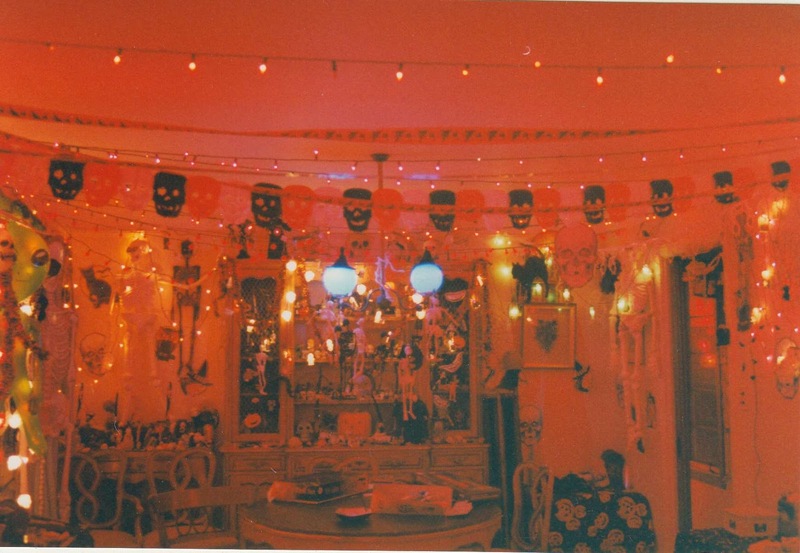 Even without a resident ghost, I do believe houses have unique personalities influenced by those who have lived in them. It may sound strange, but I have walked into homes that feel happy and some that decidedly do not. Looks like a terrific house, I would have been sorry to move away! Hello Jenny Woolf, Yes, that was an anti-climax indeed, especially since the former owner of the house was wealthy--they could at least have stored some interesting bric-a-brac in that chest!